INSPIRED – Dancing in the rain! I have been feeling so uninspired lately. For those of you who follow my blog you can tell because I have been absent. I went on a couple of quick back to back trips so I originally blamed it on being busy but even when things went back to normal I found I was sitting in front of my computer trying to force myself to write. I guess you could call it writer’s block…I was feeling insipid and the more I tried to write the worse it became. This morning I had a great workout and then met a friend for brunch. I decided maybe I needed a change of atmosphere so I went to the local library. In front of the library someone had written in chalk “The Public Library is the University of the People” That immediately made me smile. People from all walks of life go to the library. 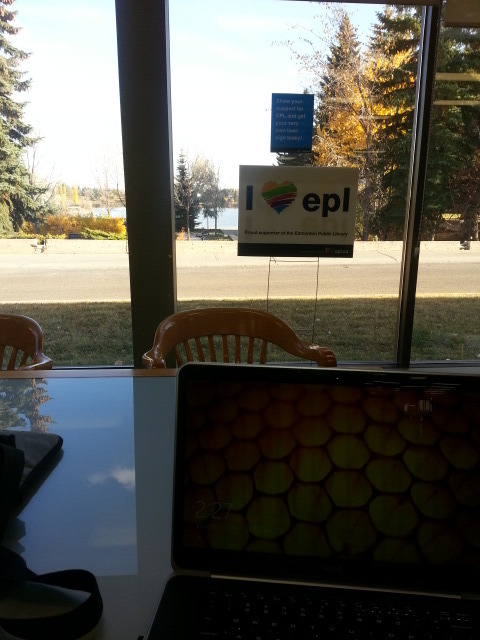 I love the library, I love books, I love the big wooden tables overlooking the lake. I loved that there wasn’t any laundry to do, dishes to wash or floors to mop. I looked around at the people and silently wondered what they were all working on, some were on laptops like me, others were reading, and some were studying. A man caught my eye. Actually a woman caught my eye and she was curling up her nose at the sight of this man. My first thought was that the man was homeless. He had unkempt hair and a very long beard and appeared to be travelling with a lot of bags. He thumbed intently through the shelves of books, wide-eyed as a kid in a candy store. Although the lady with the curled up nose appeared unimpressed I was fascinated. So many people, so many walks of life but this particular man captured my attention. He seemed enthralled by the selection of books at his fingertips. I wondered would he choose a mystery, a documentary perhaps or was he doing research? I thought of the sign written in chalk on the pavement walking in “The public library is the University of the People” I smiled. If he was indeed homeless I am not sure what paths in life led him to that place but I am glad that a path led him to the public library. He wasn’t a man on the street begging for money or my judgment, he was a man searching for a passion, an escape, and maybe characters to enthrall him and take him to different lands he may never find the opportunity to visit. The public library didn’t belong to me or the lady with the curled up nose, it belongs to all of us; the people. I believe a lot of them are not so different then you and I. I have made bad choices in my life, none of us are exempt from that. Did a choice or a succession of choices lead to a situation that was so overwhelming and beyond their control that they couldn’t find their way back? Was it an illness, a death, an addiction, a tragedy? I am not going to pretend to have heart and sympathy for everyone who has crossed my path, I am no saint, but I do believe that everyone has a story, like characters in a book. It is so easy to sit back and be a critic but you can’t judge a person by their appearance anymore then you can judge a book by its cover. All of us are just characters in the book of life, all of us faced everyday with good, with evil, with conflict and choices. I started writing a book almost ten years ago. I had faced some very difficult marital problems and in writing I found a creative outlet that allowed me to escape from my own problems. I fashioned characters in my head and penned them to paper. I literally penned them (I didn’t have a computer ten years ago). For a while the characters were like family to me. I felt their joy and their pain. At some point, maybe as I began to heal I put the characters on a shelf but they were still very much alive in my head. They were like family to me, I didn’t see them every day but they were always in my heart. Recently I was thinking of the characters a lot and I looked through my garage until I found a bin of crumpled, handwritten words, lives that I had created and woven together many years ago. It was like being reunited with old friends. These characters faced pain and decisions and they made mistakes. If you drew the wrong page out of the book, without knowing the whole story maybe you would hate the characters, maybe you would think they were hateful, shallow or foul. However, maybe if you read the whole story you would fall in love with them, you would forgive them their missteps and cheer for them. You would long to help set them on the right path because you had faith in them. When I first found the basket of crumpled papers I became obsessed with finishing the story. At a certain point I became overwhelmed. Years had changed me and the way I think and feel and some of the plot that was in my head was arduous to put onto paper. I had a beginning, a middle and an end but drawing a straight line and connecting that all became so overwhelming that I took something I loved and turned it into a chore instead of a passion. I would think to a person who has been knocked down in life and experienced rock bottom it must be a very overwhelming place to be and to navigate your way back up. I am sure at some point they saw their way out, could see a light at the end of the tunnel. Maybe the path was too rocky, too overwhelming. We will never know just by looking at them and turning up our nose. Could a smile or a kindness make a difference? I believe it can. I smiled at the man and sat down with my coffee. I decided that along with my change of scenery I needed to change my direction. My problem is I couldn’t write in a straight line from beginning to end and maybe that is OK.
One day I hope to share the whole story with you, until then I will take each day one day at a time. Hi Chris I am doing good, how are you? I think I will stay close to home. No trips planned till February. I’m fine, thanks 🙂 how are your daughters? They are great and keep me very busy. They have a Skate-a-thon fundraiser for their league this weekend. You have a fantastic day! Good luck for the fundraising 🙂 you too! Wow, I remember writing a few short stories way way back (with a pen too!) and I’m sad that I no longer have them with me. After moving so many times and having kids and all that, I just lost interest (for quite some time) and threw them away. I would have loved to read them now. Though they were nothing brilliant, it would have been nice to have a glimpse of the “old me”. This is something for some reason I can’t give up on. I think I just need to relax and not force it and it will come. I also found some very old stuff from when I was 20 which was way different from the stuff I wrote at 30. It’s all experience I guess.